1) My favorite pop-up book when I was little was of a haunted house. 2) I love when books give me the creeps. 3) I hate when books have dreams in them. 4) I only cry when reading a book if a dog is involved. 5) When I finish reading a book, it still looks brand new. If you could physically put yourself into a book or series…which one would it be and why? 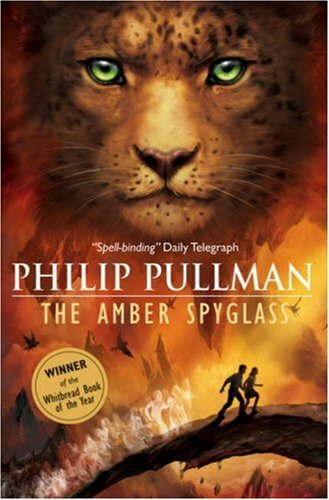 I would love to put myself in The Amber Spyglass! I did not want to leave that book. I would visit that beautiful world Mary Malone stayed in. I would meet Lyra and Will. I'd try to separate my daemon from myself so I could see what it looked like. I hope everyone has a beautiful Friday! What's the weather like where you are? I can't wait to spend some time in the sunshine. Really? dreams? Why don't you like dreams? for the deus ex machina reasons? What about if they are books where dreams are places where there is a dream world? I cry when a dog is involved, too! I cried while reading The Knife of Never Letting Go by Patrick Ness! I'm your new follower, let's connect! I'm in Vancouver, the weather here is really beautiful! We went hiking today. Weather down here in the Dallas area is mild. New tulips coming up and the myrtle trees are all sprouting leaves now. New follower hopping through! I stopped by from the hop. I think the only books I have ever cried over are all by Nicholas Sparks. Good for you for taking care of your books! I love the scrolling pictures at the top of the blog! This is new right??? Nice touch! I haven't read the series you mentioned. I try to keep my books looking new as well. I don't like to read books that will make me cry. Great blog! New follower:) I'd probably put myself into the Mortal Engines series by Philip Reeve. If you love adventure and steampunk, it's the series for you! I would absolutely love to have a daemon. I think the world in His Dark Materials would be an awesome world to be a part of. Great answer! Hopping through. I'd love to have my own daemon! Hey there! New follower here! I try to make sure my books look brand new once I finish reading too! Newest follower here via the Friday blog hop. I am a new contemporary romance writer and a reader of almost anything! Hope you stop by and check out my blog.